The life story of Étienne (Stephen) Brûlé, interpreter and explorer, contains an element of mystery. He was born about 1591, at Champigny-sur-Marne near Paris. He is believed to have made the voyage to Quebec in the company of Samuel de Champlain in 1608. It was the decisive move in his career. He was to become an interpreter, or dragoman (truchement in French), between the French and their Amerindian allies. But he was above all a pathfinder and a scout. He played an essential role in the first documented journeys of exploration in New France by going ahead of Samuel de Champlain, Gabriel Sagard, Jean Nicolet, Nicolas Perrot and others of their ilk along the route to the Great Lakes. He appears to have been the first European to set eyes on the Ottawa Valley, Georgian Bay, Pennsylvania and four of the Great Lakes, and to give at least an oral description of them. Brûlé left again immediately, taking the direction of the country of the Hurons. Their territory was located on the peninsula between Lake Ontario and Lake Huron. To reach it he must have travelled up the Ottawa and the Mattawa rivers, then crossed Lake Nipissing, and followed French River down to Georgian Bay. In July, 1618, Brûlé arrived back in the colony after an absence of thirty-four months. By his own account he was the first European to explore what is now the State of Pennsylvania. It was Gabriel Sagard who, in 1624, discredited Brûlé in Champlain’s eyes. The Récollet friar denounced the wandering adventurer’s loose morals, and disclosed moreover that Brûlé was playing a double game: he was working at the same time for the administration of New France and for the fur merchants, who were opponents of Champlain. 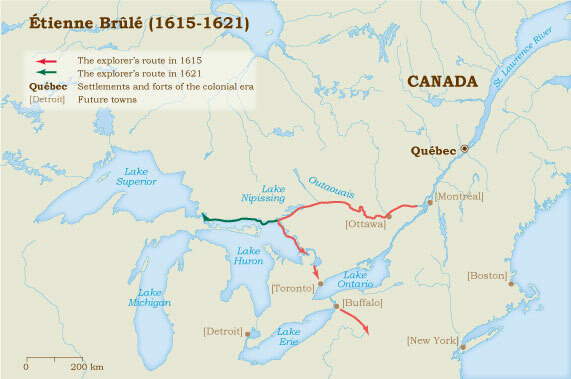 Brûlé was killed by the Hurons while the colony was still under the English. The news reached Champlain when he returned to Quebec in 1633.